This has been an unusual March. It's supposed to be breezy, "comes in like a lion," and all that. But this March has been more than breezy. 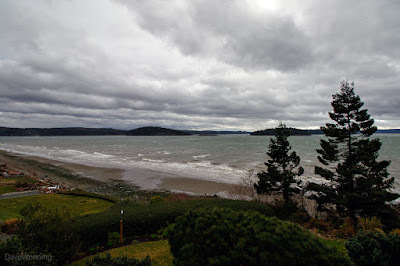 Yesterday, we had our second significant windstorm in three days. The first one on March 10th hit at the same time as an extreme high tide. The combination had some dramatic effects on the neighbors' front lawns. My weather station clocked a peak wind of 42 miles per hour, 68 kph when the tide was highest. A second storm rolled through yesterday afternoon, March 13th. From news reports, it sounded like this one had more widespread damaging effects. My weather station recorded peak wind speeds of 36 mph/58 kph several times during the storm. Miraculously, my power stayed on through both of them. I would expect this pattern of storms in November or December, but not March. The photo above of a threatening sky over Skagit Bay was taken at 15:15 PDT as the storm was ramping up. At 18:45 the worst of the winds had passed by. 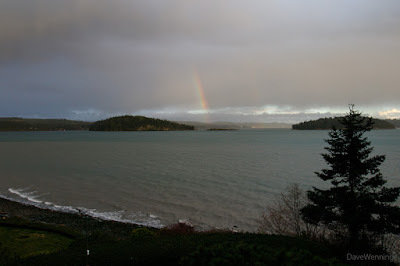 The weather spirits managed to eke out a bit of a rainbow and even some clearing skies in the background. Grand scenery and wide open spaces. Love the trace of rainbow.